The People's Republic of China is the largest producer of coal in the world, while the United States contains the world's largest 'recoverable' coal reserves (followed by Pakistan, Russia, China, and India). China and the United States are also among the largest coal consumers. Other important coal producing countries include Australia, India, South Africa, and Russia. Coal mining in the United States has historically had economic and cultural dominance in regions such as the Allegheny Mountains and Appalachian Mountains, where it was a major part of identity and traditions. The replacement of workers by mechanization has had major consequences for the industry and for the people it affects. Coal is mined in the Appalachian Mountains region, and the Midwest. Most coal now produced in the United States is mined in western surface mines, especially in Wyoming's Powder River Basin. A surface mining method often used in the Appalachians is mountaintop removal mining. The states with the largest recoverable coal reserves are, in descending order, Wyoming, West Virginia, Illinois, and Montana. The largest single mine in the United States is the North Antolope Rachelle near Gillette, Wyoming; it produces more coal annually than many states. In 2009, it alone produced over 100 million tons of coal, and has plans to produce 130 million ton in 2012 more than 23 other coal producing states including Pennsylvania. Silesia in Poland and Czech Republic has more working coal miners than the rest of the European Union combined. United Kingdom - Britain had major coal-mining activity in the past, but since the 1980s coal mining has been in decline due to the increased use of natural gas in power stations and cheaper imports. Very few working coal mines and open-cast quarries now exist in Britain. In England, the West Midlands region, which covers the western part of the English Midlands. The West Midlands conurbation is the name given to the large conurbation in the region that includes the cities of Birmingham and Wolverhampton. The "Black Country" is a loosely defined area of the English West Midlands which includes the north and west of Birmingham and the south and east of Wolverhampton, famous for its coal mines (especially in Staffordshire), its coal coking operations, and other heavy industry, including iron foundries and steel mills that used local coal to fire their furnaces, all of which produced a level of air pollution that had few equals anywhere in the world. The Kent coalfield in Kent in South East England also had coal mining operations. In South West England, Somerset was the location of the Somerset coalfields until 1973. 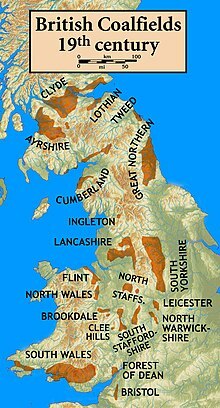 Yorkshire in North West England also was formerly home to major coal mining operations. In Wales, the South Wales coalfield provided a large amount of Welsh coal. There are large coal deposits in Asturias and León which helped fuel the Industrial Revolution in Spain; these have mostly been exhausted. Donbas, Volyn, and Halychyna are coal-mining regions. The Jiu Valley is a coal-mining region. Kolubara and Kostolac are coal mining regions. The REMBAS region near the Resava River is a coal-mining region. The Ruhr Area in North Rhine-Westphalia, Lower Lusatia, and the Central Germany lignite mining area are some of the coal-mining regions. End of 2010 there were five operating hard coal mines in Germany: 1: Bergwerk Ibbenbüren, Ibbenbüren, 2: Zeche Auguste Viktoria, Marl, 3: Bergwerk Prosper-Haniel, Bottrop, 4: Bergwerk West, Kamp Lintfort, 5: Bergwerk Saar, Saarlouis. Germany's last operating black coal mine, Prosper-Haniel, closed on Dec. 21, 2018. Nord-Pas de Calais Mining Basin, Loire coal mining basin and Saar-Warndt coal mining basin were the major coal-mining regions. The sillon industriel contains the former coal-mining area, Pays Noir, or "Black Country." It runs across Wallonia, passing from Dour, in Borinage, in the west, to Verviers in the east, through Mons, La Louvière, Charleroi, Namur, Huy, and Liège, following the valleys of the rivers Haine, Sambre, Meuse and Vesdre. It is also known as the "Sambre and Meuse valley", or the "Haine-Sambre-Meuse-Vesdre valley", or the "dorsale wallonne." Kuznetsk Basin of southwestern Siberia is a coal-mining region. China is currently the world's largest coal miner, and it is also the largest consumer of coal in the world. China’s coal output has continued to increase and its production capacity has expanded at an unprecedented rate, with an annual increase in production of 200 million tonnes on average. In 2012, the total output of coal reached 3.66 billion tonnes. However, based on China’s existing coal mining technologies, this level of output greatly exceeds the sustainable coal production capacity in terms of resources, the environment, and safety. Behind this huge production statistic are excessive waste of coal resources, a large number of casualties among workers, and serious damage to water resources and the environment. These problems are the basis of resistance for the continued development of China’s coal industry. Mongolia has proven reserves of 12.2 billion tons of coal including 2 billion tons of coking coal and 10.1 billion tons of thermal coal. Mongolia is estimated to have potential coal reserves of some 100 billion metric tonnes. While Mongolia's output is approximately only 5 million tonnes of coal per year, it will grow significantly given its proximity to China. India has some of the largest reserves of coal in the world (approx. 267 billion tonnes ). The energy derived from coal in India is about twice that of energy derived from oil, whereas worldwide, energy derived from coal is about 30% less than energy derived from oil. The discovery of a vast deposit in Sindh Province in the 1990s, has led to a JORC resource, in the region of 175 Billion tonnes, work is ongoing with production expected to commence in 2013, with several foreign companies competing to mine various blocks of the resource. In South Africa coal is mined in several regions, mainly in the East Rand around Witbank, in the Vaal valley around the Vaal Triangle, the Waterberg in the Limpopo Province and at Dundee and Newcastle in northern KwaZulu Natal. South Africa is currently the leading African coal producer. Russia is currently the fifth largest producer of coal, and has the second largest reserves, estimated at 175 billion. The majority of its coal is located behind the Ural Mountains in Siberia. By 1999 approximately a third of coal mining business was privatized. Since then, the industry has concentrated in hands of few companies - coking coal producers were integrated with steel makers, and two national leaders in steam coal emerged. Russian coal miners have recently campaigned for improvements in their working conditions, leading to some reform. Mechel controls the Southern Kuzbass Coal Company in Kuznetsk, the Elga Coal Field in the Sakha Republic with 2.2 billion metric tons of reserves of coal, and the Neryungrinsky coal mine at Neryungri in the Sakha Republic. Other coal producing regions include the Pechora basin of brown coal in northern European Russia, the Kansk-Achinsk basin with total reserves 600 billion tons of lignite centered on Kansk in southern Krasnoyarsk Krai, Tunguska coal basin in eastern Siberia located between the Khatanga River to the Trans-Siberian railway and between the Yenisei and Lena rivers, and the Lena coal basin which is mainly in the Sakha Republic with some in Krasnoyarsk Krai. ^ US Energy Information Administration: World estimated recoverable coal, Excel spreadsheet, downloaded 27 January 2009. ^ "Annual Coal Report - Energy Information Administration". www.eia.doe.gov. Retrieved 2017-09-18. ^ US Energy Information Administration: Recoverable coal reserves and average annuay recovery percentage at producing mines by state, 2006, 2005, PDF file, downloaded 27 January 2009. ^ Lepisto, Christine (December 25, 2018). "German President gets coal for Christmas as last black coal mine closes". TreeHugger. Retrieved 2019-01-26. ^ Badgaa, Ganbaatar. "Current Status of and Prospects for Energy Resources and Infrastructure Development of South Gobi in Mongolia" (PDF). Ministry of Fuel and Energy Mongolia, Department of Fuel Policy and Regulation. Retrieved 28 August 2010. ^ "Investment Opportunity: Minerals". Foreign Investment and Foreign Trade Agency (FIFTA) The Government of Mongolia. Retrieved 28 August 2010. ^ "Elga Coal Complex". Mechel. Retrieved 16 August 2017. ^ "Elga Coal Complex: history". Mechel. Retrieved 16 August 2017. ^ ""Якутуголь" планирует в сентябре открыть обогатительную фабрику на Эльгинском месторождении мощностью 3 млн тонн". Металлоснабжение и сбыт (in Russian). 21 August 2012. Retrieved 16 August 2017. This page was last edited on 26 January 2019, at 15:42 (UTC).